This tangy, salty cheese originated in Greece. They usually make it with a combination of sheep and goat's milk. I use our goat milk but you can use cow's milk too. This cheese can be sliced and frozen to crumble later or crumbled now, frozen on a sheet and then bagged to keep. Its one of the easier cheeses to make and is a bit more forgiving that others. Heat the milk in a double boiler until it is 86 degrees. Turn off heat. Add dry culture and stir. If you are making more than one gallon you will need to double, triple, or quadruple your measures. Let sit for 30-45 minutes. Add liquid rennet (don't forget to multiply if you are making more than 1 gallon) over a slotted spoon to help disperse the rennet. Stir for 10 seconds and then slow the milk from swirling. Allow the milk to set for 10-15 minutes to coagulate. Let it sit for another 45-60 minutes until it starts coming off the side of the pot. Even if you go a little past that point it will still be fine. Cut the curd int 1" cubes vertically. Then use a bent ladle to cut to cut 1" horizontally. Stir the curds a couple times each 5 minutes for 20 minutes total. Drain into a cheesecloth lined colander. They are quite full of whey so you may need to allow them to drain some before putting into your cheeseform. Then add the rest and drain and then add them to the cheeseform. You can use any type of form or container as long as it has small holes and a bottom. I set my cheeseform on top of another cheeseform that was flipped so it wasn't sitting in whey. You do not need a cheesecloth in the cheeesform. We made 4 gallons of milk and this is how full the container was! In 15 minutes it has already drain this much! After about 30 minutes and with a little help from someone you should be able to flip it. Flip every hour or two for about 8-12 hours. At this point it is pretty much done draining. Time to add some non-iodized salt. Sprinkle with salt morning and night for 3 days while it sits out at room temperature. Excess salt will drain away. If by chance you notice a slippery surface you will need to move your cheese to the fridge. This is more of an issue in a hot, humid summer. Tada!! After 3 days of room temperature salting this is what we have. Shared with permission from Merryl Winstein. She wants everyone to learn to make cheese! I have been trying to put a Lot more fruits and vegetables this year in my family's diet. I have been trying a lot of easy Greek recipes which calls for feta cheese. It really is delicious in Greek dishes. I am sure your feta cheese would be much better because it is so fresh and homemade. Thanks for sharing! Shared on ALL social media. I plan to use it for other than salads sometime too. I love feta cheese but never thought to make it. 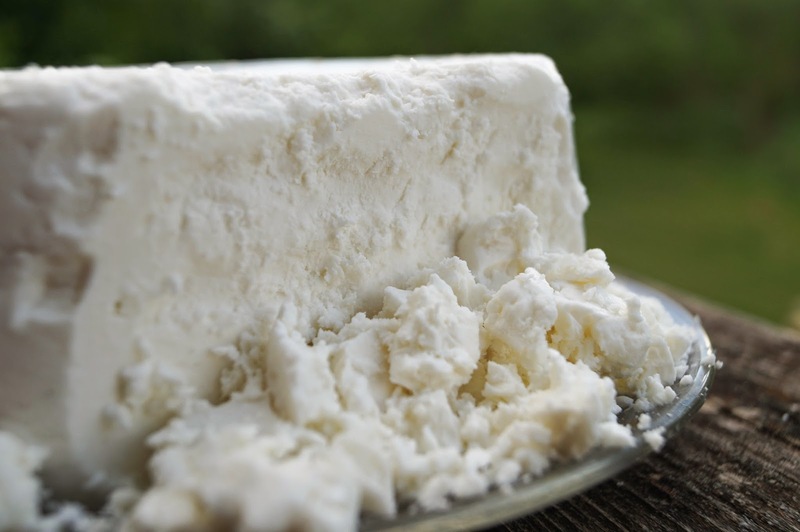 I've made ricotta cheese which is easy, I would love to try making feta, though you have an advantage with the fresh goat's milk, that is so amazing. My grandson would love this. It does help that I have the "real" stuff here Joanne! I am stopping by again now that I have time to share on all my social medias. You make me want to get some goats. My special needs son would love and so would my teens. This is great! I've made paneer, yogurt cheese and mozzarella but haven't ventured into feta. I'm starting to see goat milk in the supermarkets now, too. Thanks! Feta is one of my favorite cheeses. I put it on everything! One of my goals for the year is to start making my own cheeses. Your step by step pictures and instructions are perfect to help me reach this goal. Thank you so much for sharing! Great, glad I can help you! This is so cool! I never thought about making feta cheese before! I love it though, so I am excited to learn that you can! Yep, pretty much a no brainer on this one. I love cheese. I've never made any kind before, though. The process looks so cool! Fun to start with milk and end up with cheese! I wondered how it was made. Cool. The process was very nicely explained! I love feta but it's just too expensive to buy in the store these days. I don't think I'd have the patience to make it, sorry to say. Best wishes! I've always been scared to try making cheese--but this looks fun! Jenny, I remember you from when we all lived out on the old country road! I am amazed at what you have done and so proud to say I knew you when! Your parents and Tina must be so proud! 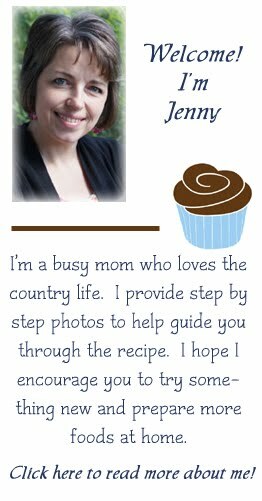 I have a recipe blog, no update or conversation; just good old recipes. If you are talking over by Pleasant Lawn, my parents still live there!! Glad you could join me on my blog journey! Yes, that place and time hold a special place in my heart. So glad I 'found' you! Love your garden pics! Wow jenny! You make it seem so easy! You really did make it seem easy! I have never seen this done before..congratulations! And thanks for sharing it on the Thursday Blog Hop! What a cool idea this is. I didn't know we could make this at home. I love this because goat cheese is the only cheese I can have so I will have to try this. So glad I saw it on the Let's Get Real link up! Hmm I love feta. And I have made yogurt, cheese is next. Thanks for sharing with Let's Get Real (I'm co-hosting this week)! What a great idea. I love feta cheese but never thought of making it. I am impressed. I just may have to try this. You made one fine feta cheese Jenny! Thanks for coming and linking up at The Weekend Social. Please be sure to come back next week starting Thursdays at 9PM EST on culinaryflavors.gr ! I hope to see you there! I made mozzarella cheese a few months ago and it was yummy! I bet this is fabulous too! Thanks so much for sharing this with the Let's Get Real party.